After a few months of studying, I passed VCP510 in January. It was a good thing to as I passed it 2 days before I began teaching my vSphere 5 ICM courses through the VMware IT Academy. A requirement to teach the VMware courses is passing the associated certification (in this case VCP510) for the course you wish to teach. Similar to a VMware Certified Instructor, passing score is 350 not 300 for the general public. I covered the spread so that’s all that matters. So how hard is this test? Coming from the Microsoft certification world and never having taken a Cisco exam, I thought VCP410 was the hardest exam I’d ever taken. VCP510 topped that. This is no slouch of an exam where you can grab a book a week before and pass. The breadth and depth of knowledge is incredible. Viewing the blueprint for the exam shows you that it covers just about everything AND the kitchen sink. Without breaking my NDA, here are my thoughts on the exam. Then, I’ll discuss how I prepared for the exam. 1. You need to review everything in the blueprint…no exceptions. You don’t necessarily have to read every white paper (though it might help), but there are a number that will be quite helpful. 2. You need to have hands-on experience with vSphere, vCenter Server, and the rest of the components and features. VMware upped their game on this exam and you really have to be able to visualize working within vSphere to be successful. 3. I found that there was a good amount of carry-over knowledge from vSphere 4.x and VCP410. 4. Make sure you are familiar with all of the new/updated features and product add-ins. vCenter Server Appliance, vSphere Storage Appliance, and vCenter Update Manager are products you need to install and run in a lab scenario. 5. You need a working functional lab environment that will allow you to perform all of the labs from the vSphere 5 ICM course. This includes vMotion, HA, and Update Manager. Working with FT is helpful as well. 2. Download current BluePrint from mylearn.vmware.com. I will list them below, but a few VCPs have posted detailed BluePrint blogs that I found very helpful as well. 3. I created my own detailed blueprint based on the actual blueprint. Below I have links to detailed blueprints created by others. 4. 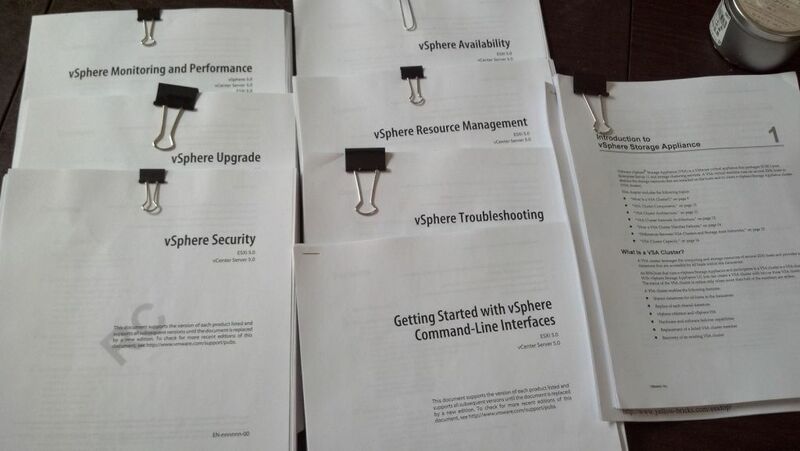 Read Mastering vSphere 5 by Scott Lowe cover to cover. This is IMHO the definitive guide for vSphere 5 and the best book on the market for learning Mastering vSphere. It fills in the gaps left by the official VMware courseware. 5. I re-read the official VMware Courseware for vSphere 5 ICM. Since the courseware is more focused than the Lowe book, I was able to rip through it in 4 days. I completed (again) all of the labs from the ICM course as well. 6. I copied the BluePrint sections into a Word document and began fleshing out the sections, focusing on areas I was unfamiliar or not solid in. a. Also, I was able to deploy an SQL-based vCenter Installation along with the embedded version. Along with the school’s setup, I also had a VMware Workstation 8 environment that mocked up the vSphere 5 ICM lab environment. So I was able to complete all the labs on my laptop so I wasn’t stuck in the office during break. If you are looking for a solid lab system, Jeff built a great one for under $1000. Check it out here. If you are looking to build an environment using VMware Workstation, I would recommend go through Sammie Bogaert’s blog posting called Building the Ultimate vSphere Lab. It’s a great set of 12 blog postings taking you through the entire build process along with setting up HA, FT, vCenter Server and more. Thanks…and thanks for providing great resources to the community!